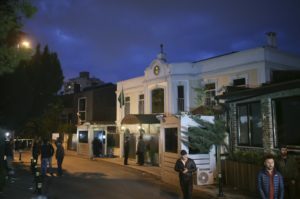 Probashbangla24 online Desk : Police searching the Saudi Consulate found evidence that Saudi writer Jamal Khashoggi was killed there, a high-level Turkish official said Tuesday, and authorities appeared ready to also search the nearby residence of the consul general after the diplomat left the country. The comment by the Turkish official to The Associated Press intensified pressure on Saudi Arabia to explain what happened to Khashoggi, who vanished Oct. 2 while visiting the consulate to pick up paperwork he needed to get married. The crown prince “told me that he has already started, and will rapidly expand, a full and complete investigation into this matter. Answers will be forthcoming shortly,” Trump said in a tweet. The president later appeared to take a stronger stance in defense of Saudi Arabia, criticizing the global condemnation against the kingdom and comparing it to the allegations of sexual assault leveled against now-Supreme Court Justice Brett Kavanaugh during his confirmation hearing. “Here we go again with you’re guilty until proven innocent,” Trump told AP in an interview. U.S. Secretary of State Mike Pompeo traveled to Saudi Arabia to talk to King Salman and the 33-year-old crown prince about the fate of the journalist who wrote critically about the Saudis for The Washington Post. Attorney General Jeff Sessions said “serious evaluation” was being given to whether U.S. law enforcement officials would aid in the investigation of Khashoggi’s disappearance. He declined to comment further, or to say whether he had any concerns with the current investigation. Saudi officials have called Turkish allegations that a team of 15 Saudi agents killed Khashoggi “baseless,” but U.S. media reports suggested that the kingdom may acknowledge the writer was killed at the consulate, perhaps as part of a botched interrogation. The close U.S. ally is ruled entirely by the Al Saud monarchy, and all major decisions in the ultraconservative kingdom are made by the royal family. Washington Post Publisher and CEO Fred Ryan said the Saudi government “owes the Khashoggi family and the world a full and honest explanation of everything that happened to him,” noting that Tuesday marked two weeks since the disappearance of the 59-year-old journalist. “The Saudi government can no longer remain silent, and it is essential that our own government and others push harder for the truth,” Ryan added. The high-level Turkish official told the AP that police found “certain evidence” of Khashoggi’s slaying at the consulate, without elaborating. The official spoke on condition of anonymity because the investigation was ongoing. Police planned a second search at the Saudi consul general’s home, as well as some of the country’s diplomatic vehicles, Turkey’s Foreign Minister Mevlut Cavusoglu said. Leaked surveillance video shows diplomatic cars traveled to the consul general’s home shortly after Khashoggi went into the consulate. Consul General Mohammed al-Otaibi left Turkey on Tuesday afternoon, state media reported, just as police began putting up barricades around his official residence. Saudi Arabia did not immediately acknowledge he had left or offer a reason for his departure. Earlier in the day, U.N. human rights chief Michelle Bachelet said the “inviolability or immunity” of people or premises granted under the 1963 Vienna Convention on Consular Relations “should be waived immediately.” That convention covers diplomatic immunity, as well as the idea that embassies and consulates sit on foreign soil in their host countries. Turkey had wanted to search the consulate for days. Permission apparently came after a late Sunday night call between King Salman and Turkish President Recep Tayyip Erdogan. Certain areas of the consulate were to remain off-limits, although officials would be able to inspect surveillance cameras, Turkish media reported. Erdogan told journalists Tuesday that police sought traces of “toxic” materials and suggested parts of the consulate had been recently painted, without elaborating. In Riyadh, Saudi Foreign Minister Adel al-Jubeir greeted Pompeo at the airport. The former CIA chief didn’t make any remarks to the media. Soon after, Pompeo arrived at a royal palace, where he thanked King Salman “for accepting my visit on behalf of President Trump” before the two went into a closed-door meeting. Pompeo then met a smiling Prince Mohammed, the heir apparent to the throne of the world’s largest oil exporter. Pompeo later said that Saudi Arabia had made a “serious commitment” to hold senior leaders and officials accountable in the case, and said the crown prince again denied any knowledge of what happened to Khashoggi. Pompeo was to have a dinner Tuesday night with Prince Mohammed and was expected to fly to Turkey on Wednesday. Trump had previously warned of “severe punishment” for the kingdom if it was found to be involved in Khashoggi’s disappearance, which has spooked investors. Trump’s warning drew an angry response Sunday from Saudi Arabia and its state-linked media, including a suggestion that Riyadh could wield its oil production as a weapon. The U.S. president has been after King Salman and OPEC to boost production to drive down high oil prices, caused in part by the coming re-imposition of oil sanctions on Iran. The New York Times and The Washington Post have reported, citing anonymous sources, that Saudi officials may soon acknowledge Khashoggi’s slaying at the consulate but blame it on a botched intelligence operation. That could, like Trump’s comments, seek to give the kingdom a way out of the global firestorm of criticism over Khashoggi’s fate. “The effort behind the scenes is focused on avoiding a diplomatic crisis between the two countries and has succeeded in finding a pathway to deescalate tensions,” said Ayham Kamel, the head of the Eurasia Group’s Mideast and North Africa division.